Hip pain is defined as pain felt in and around the hip joint Pain felt inside the hip joint or your groin area is more likely to be because of problems within the hip joint, such as hip joint arthritis. However certain disease conditions affecting other parts of your body such as the lower back could also cause hip pain. Pain relieving anti-inflammatory medications offer symptomatic relief. However, the exact cause for the pain needs to be addressed. Practicing certain measures can avoid aggravation of pain and improve the quality of life. Avoiding physical activities that may worsen the pain, stretching the quadriceps and hamstring muscles, using a cane in the opposite side and applying ice packs over the region of pain for about 15 minutes three to four times daily may help reduce both pain and swelling. 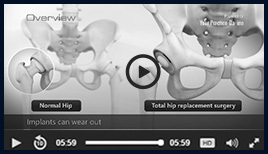 If you have constant or severe hip pain, talk to your doctor about a referral to an orthopedic hip specialist.